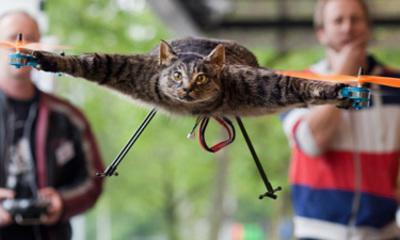 An artist has turned his cat into a flying helicopter after it was killed by a car. Dutchman Bart Jansen stuffed Orville before teaming up with a radio control helicopter expert to attach propellers to each of its four paws. The cat - named after pioneering aviator Orville Wright - is now a piece of artwork. The "Orvillecopter" is on show at the Kunstrai art festival in Amsterdam. Jansen said his creation is "half cat, half machine", and part of a visual art project to pay tribute to his pet. "After a period of mourning he received his propellers posthumously," he said. The Orvillecopter currently struggles to fly steadily, a problem Jansen has promised to fix. "He will receive more powerful engines and larger props for his birthday. So this hopping will soon change into steady flight."